Shown before framing, this 1643 map of the Great Lakes by Jean Boisseau identifies the lakes in French: Lac St. Louis (Ontario), Lac Derie (Erie), Mer Douce ou Lac (Huron), Grand Lac (Superior), and Lac des Puans (Michigan). When Greg began collecting maps, it made sense that he was attracted to maps of the Midwest, having lived in Southwest Michigan his entire life. Everything from recent township and county maps, back to the earliest maps of the Great Lakes region have attracted Greg’s attention, and he enthusiastically shares the history and stories told by his collection. “The maps I’ve collected have featured a distant relative’s farm land. Others show … names that no longer exist and are only found in history books.” The 1643 Boisseau map of the Great Lakes is one of these maps, and has a very distinct claim to fame in the history books. 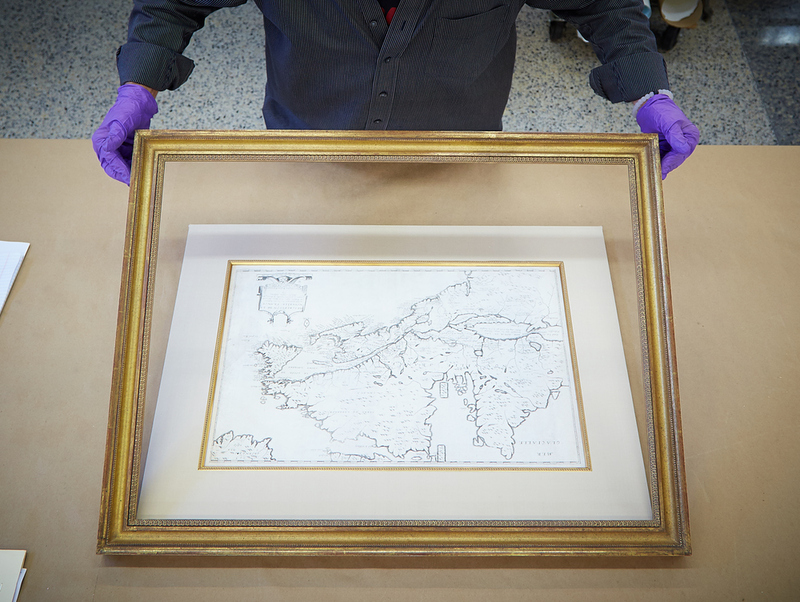 Greg and his wife only frame and present the maps which are rare and special to their collection in their home - and being the first to name all five Great Lakes certainly qualifies for this honor. Director of Conservation Framing Toby Joyce made sure to give this map housing both to beautifully showcase the print, and keep it safe for many more years to come. The map itself was secured to the acid-free mount board with individually made corners crafted from Japanese Kozo paper. These corners keep the map in place without attaching any new material directly to the print itself. The top map was fabric wrapped with silk, and a gold beaded fillet was added to the inner edge of the mat to further showcase the print. Before being installed into the frame, the framing package was completed with Museum Glass, a special glass product that reduces glare and guards against 99% of harmful UV rays that can cause irreversible damage to artwork. The framing package was then sealed with acid-free tape to create a vapor barrier, preventing moisture or dust particles from infiltrating the framing materials. Installed in the frame, the map will be featured above the rest in Greg’s home as he believes it is the pinnacle of a map collection of the Great Lakes. We here at The Center couldn’t agree more, and are pleased to have helped protect this map for many more centuries to come. Burden, Philip D. The Mapping of North America. Raleigh Publications, 1996.